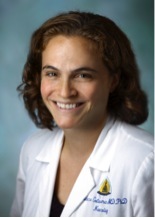 Rebecca Gottesman, MD PhD completed both her undergraduate and medical training at Columbia University in New York. She came to Baltimore for internship followed by neurology residency at Hopkins. After residency she stayed for a stroke fellowship, and received a Clinical Research Scholars award to allow her to complete a PhD in Clinical Investigation at the Hopkins Bloomberg School of Public Health. Since joining the Hopkins faculty in 2006, Dr. Gottesman has been involved largely in clinical research and epidemiology, with clinical work in Vascular Neurology. Her research interests include stroke and other neurologic complications associated with cardiac surgery, as well as the short- and long-term cognitive consequences of stroke. In particular, she is a coinvestigator with the Atherosclerosis Risk in Communities (ARIC) study, studying vascular contributions to cognitive impairment and leukoaraiosis, and is the current PI of an ARIC ancillary study in which she is evaluating the relationship between vascular risk factors and amyloid deposition, evaluated using PET brain imaging. Now an associate professor of Neurology, Dr. Gottesman also has a joint appointment in the Department of Epidemiology, in the School of Public Health, and is an associate faculty member in the Welch Center for Prevention, Epidemiology, and Clinical Research. 1. Gottesman RF, Bahrainwala Z, Wityk RJ & Hillis AE. Neglect is more common and severe at extreme hemoglobin levels in right-hemispheric stroke. Stroke. 2010; 41(8): 1641-1645. 2. Gottesman RF, Coresh J, Catellier DJ, Sharrett AR, Rose KM, Coker LH, Shibata DK, Knopman DS, Jack CR, & Mosley TH. Blood Pressure and White Matter Disease Progression in a Biethnic Cohort: The Atherosclerosis Risk in Communities (ARIC) Study. Stroke. 2010; 41(1): 3-8. 3. Gottesman RF, Grega MA, Bailey MM, Pham LD, Zeger SL, Baumgartner WA, Selnes OA & McKhann GM. Delirium after Coronary Artery Bypass Graft Surgery and Late Mortality. Annals of Neurology. 2010; 67(3): 338-344. 4. Gottesman RF & Hillis AE. Predictors and Assessment of Cognitive Dysfunction Resulting from Ischaemic Stroke. Lancet Neurology. 2010; 9(9): 895-905. 5. Selnes OA, Gottesman RF, Grega MA, Baumgartner WA, Zeger SL, & McKhann GM. Current Concepts: Cognitive and neurological outcomes after coronary artery surgery. New England Journal of Medicine, 2012: 366(30): 250-7. 6. Gottesman RF, Sojkova J, Beason-Held LL, An Y, Longo DL, Ferrucci L, & Resnick SM. Patterns of regional cerebral blood flow associated with low hemoglobin in the Baltimore Longitudinal Study of Aging. Journal of Gerontology: Medical Sciences, 2012: in press.